Interesting how the clerk botched the given and middle name. This is more proof – even when we locate the official records there is no guarantee the record contains accurate information. This record gives me an exact birth date, which may be very helpful at some point in the future – if it is actually correct. It does appear to be in the right ballpark based on census ages. I am not at all surprised to see her listed as white on this record. She was married to a white man and living an assimilated lifestyle. She has been recorded in census records as white ever since she married. Leon Horton (Carrie’s son) is the informant for this record. I have to wonder if this is a case of the clerk not asking the question about the parents or if her parents are truly unknown to Leon. He was born in 1887 and therefor a young adult by the time Laton and Marleah crossed over. He lived near them in Stockton until at least 1900. He certainly knew the people his mother referred to as her parents (his grandparents). Most folks would list the adoptive parents if the real parents were unknown in an attempt to legitimize the person. Today we don’t usually have a problem with unmarried parents and such, but during the lifetime of this lady and her children it would have been a very big deal. Perhaps Leon knew neither Laton nor Marleah where Carrie’s real parents and wanted a record of it for future generations. But, at the risk of being known as illegitimate? No, I don’t think that makes sense. My gut says the question was never asked. If I lived near East Randolph I would go visit the town clerk and ask to browse through the register. I would look to see if all the other records near this time had “unknown” parents. If so, that suggests the question was not being asked. If on the other hand they all have parents and this is the only record that does not, then I would say this is the information provided by Leon at the time of Carrie’s death. There is also the possibility that Leon is attempting to hide his mother’s Native heritage but not providing the Kanistanaux name in public records. This is mere speculation at this point, as I have nothing to suggest Leon or his sisters were ashamed of their Native heritage. However, the family is living near Seneca Nation reservations during a time period when there is racial tension and strong stereotypes. It was probably very difficult living off-reservation in white communities and being known as “Indian”. This could have been a motive and is therefore something I need to keep in mind. Once again – more questions. Death Records are public information. Carry died in 1931, which is before Social Security was invented. 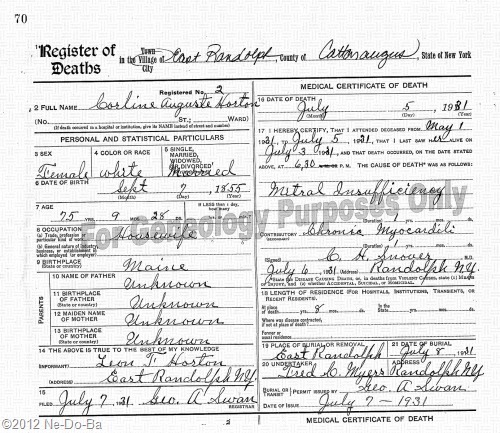 What do you think someone can do with a death record over 80 years old? Do you think someone is going to steal her identity? Do you think Social Security will issue her a Social Security number? I just don't understand why people think death records (especially old ones) should be protected from public access.